It's reasonable to be a little disappointed already: Intel decided that the first representatives of the new Broadwell generation wouldn't be ultrabook processors or high-performance quad-core powerhouses -- instead they started the Core M series with chips for tablets and thin, 2-in-1 notebooks. Wait a second, Core M? That's the new label for the CPUs that until now have been characterized by a simple "Y" at the end of their model numbers, whose power consumption rates lie considerably below the 15 Watts needed by processors in the "U" series. 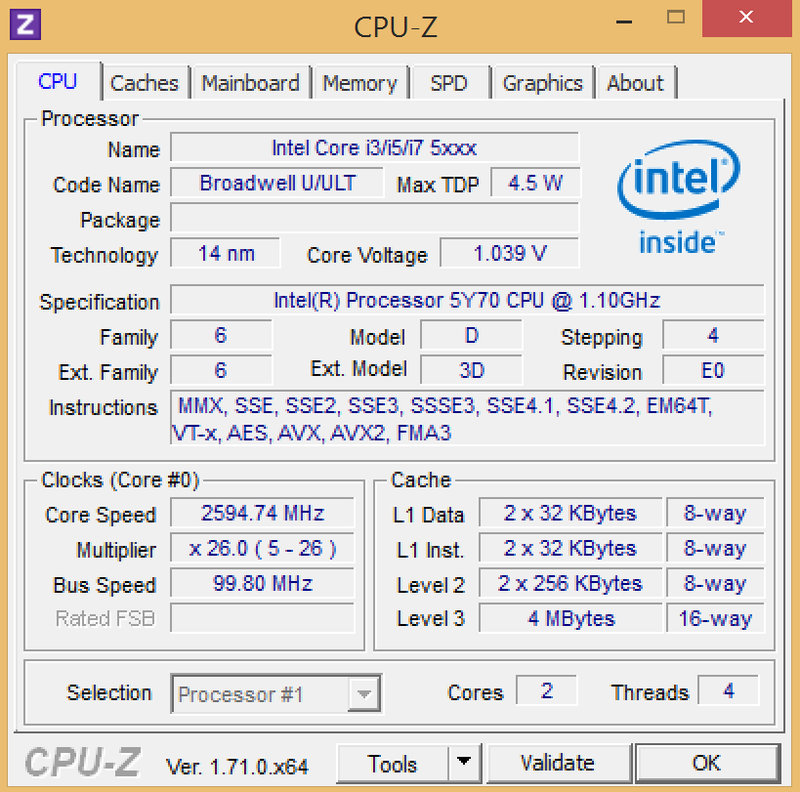 While some Haswell models were specified at 11.5 Watts, the TDP for Core M processors has sunk to just 4.5 Watts. Intel promises that this will enable manufacturers to build thinner devices with passive cooling. 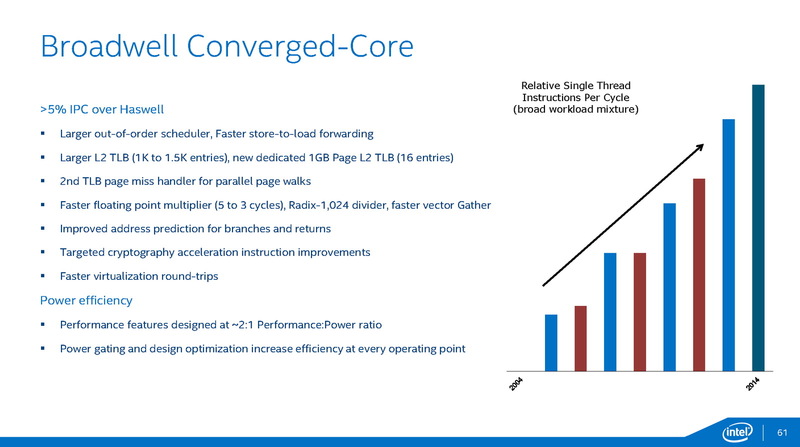 Now we'd like to take a more theoretical look at the innovations at work in the new Broadwell architecture. Afterwards, we'll discuss the benchmarks and the impressions the new technology made on us in practice. 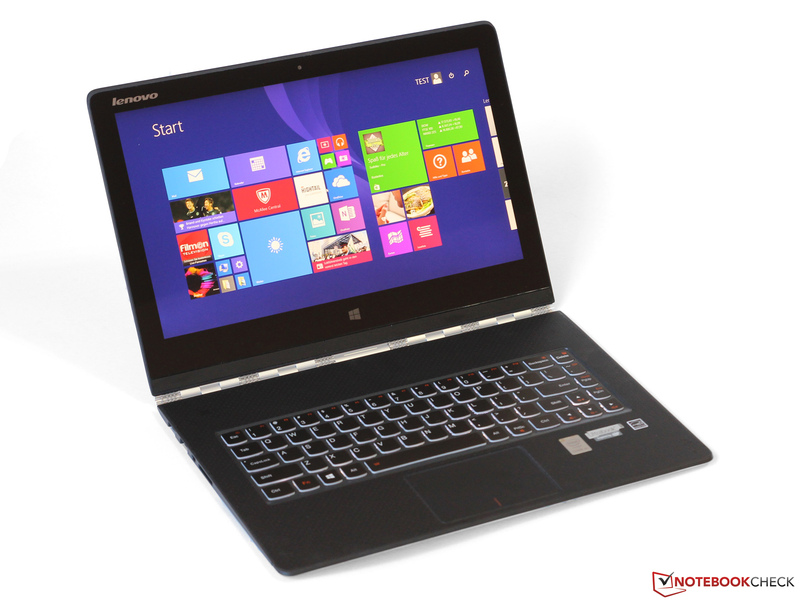 The Lenovo Yoga 3 Pro serves as our test device. 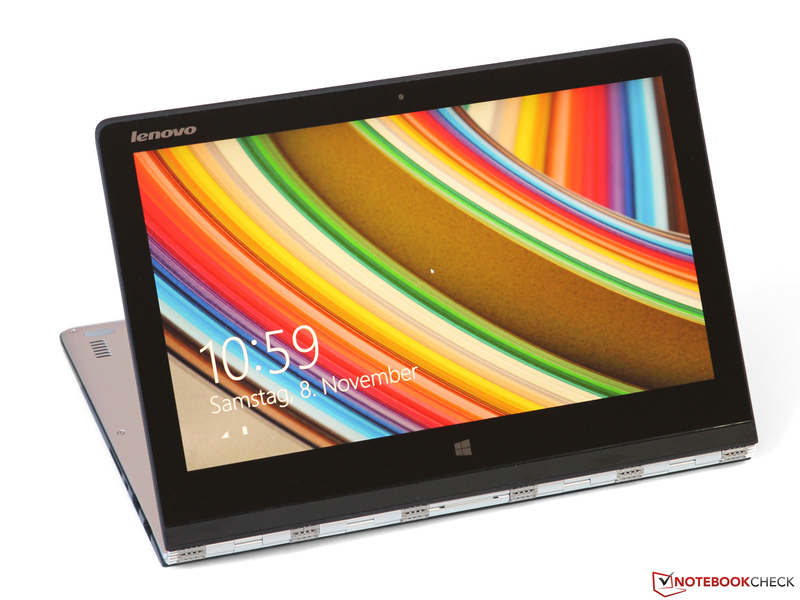 By the way: Our full review of the Lenovo Yoga 3 Pro will be published shortly. Though the number of transistors in the Core M processors increased from 0.96 (Haswell-Y) to 1.3 billion, their size shrunk from 131 to just 82 mm². The new 14-nanometer manufacturing process makes this possible. The process, internally referred to as P1272, represents the second generation of so-called FinFET transistors, which no semiconductor manufacturer besides Intel has been able to prepare for series production. But even the chip giant Intel has had to deal with months of bad yield rates -- i.e. low profits from functional chips -- which is why the manufacturer wasn't able to start up mass production until just before Broadwell's release. As per usual, the new manufacturing process should offer not only nearly double the packing density, but also lower leakage currents and considerably better energy efficiency overall. 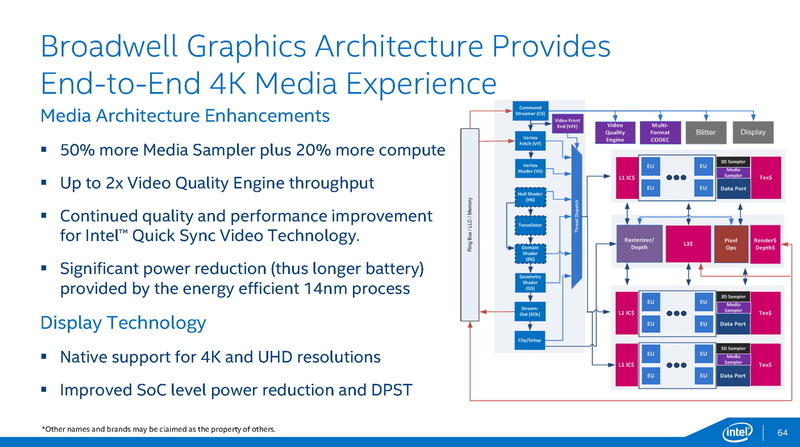 Intel promises that low-voltage processors, like the Core M CPUs, will have especially significant advantages over older models -- hence the earlier start in production for this class in particular. The chipset that resides in a package directly beside the CPU is manufactured in the now almost antiquated 32-nanometer process. Even so, depending on the device's level of load, the energy consumption rate can still be reduced by 20 to 25%. Medium-term, Intel may shift to fully-integrated SoC architecture here as well, since more compact chips and carriers can only be realized in this way. 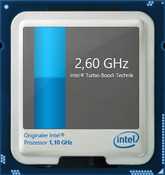 As far as the "tick" in Intel's "Tick-Tock" model goes, the Broadwell architecture isn't completely redesigned. 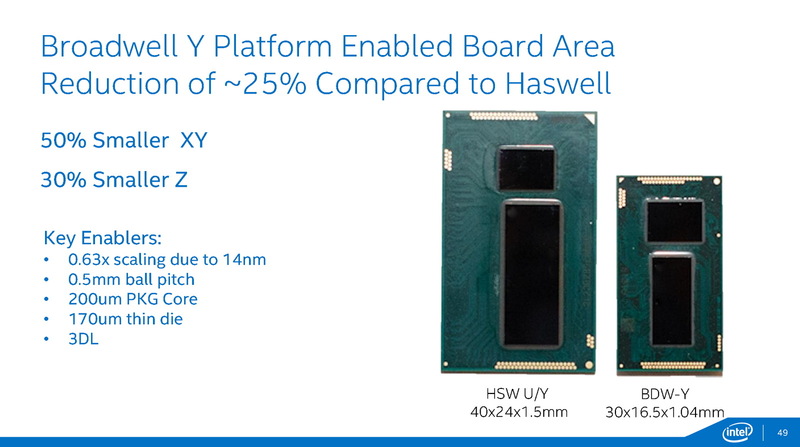 Here and there, there's an improved 14-nm version of components in the Haswell CPUs. Even so, there are some interesting changes to report, ranging from newly-optimized jump prediction to enlarged buffers, like the L2 TLB, which has been expanded to 1500 entries. The bottom line is that the processor's per-MHz performance should increase by at least 5%, and in some special cases (for instance cryptography applications and HPC) the increase is expected to be considerably greater. Especially interesting: According to Intel, the increase in energy consumption for any improvement had to be far outweighed by the gain in performance -- that is to say, their focus as developers wasn't simply on increased performance at any cost, but instead on maximizing the chip's efficiency. 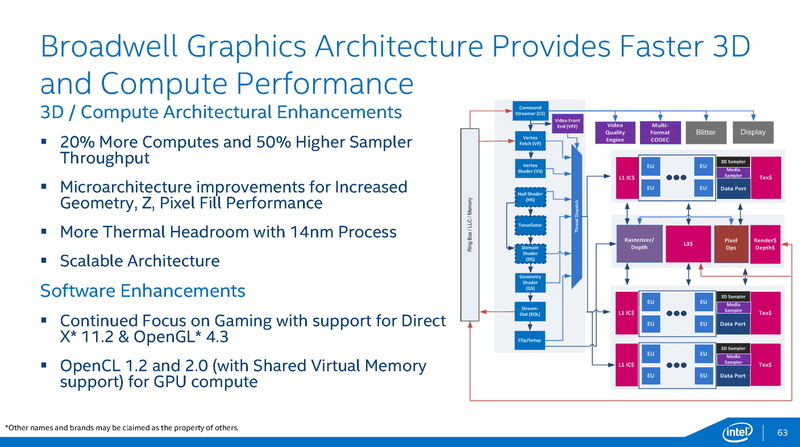 Intel modified the integrated graphics unit much more comprehensively than they did the CPU. The manufacturer's Gen8 architecture now supports OpenCL 2.0 as well as DirectX 11.2, which means that in terms of features, the GPU is now fully equipped to compete against its rivals from AMD and Nvidia. Similar to earlier generations, the GPU is constructed out of so-called slices and subslices. The shader-clusters and execution units (EUs), in turn, are integrated into the subslices. While the Haswell HD Graphics 4200 card had two subslices with 10 EUs each, the new HD Graphics 5300 has three subslices, each with 8 EUs -- in total, then, the number of EUs rose from 20 to 24. 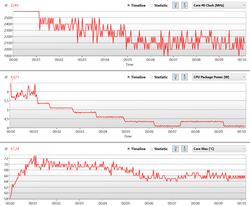 Larger L1 caches, improvements to the front-end, and various other tweaks should give the performance an extra boost. Looking at Broadwell's multimedia capabilities, the avant-garde H.265 decoder is particularly interesting. The decoder doesn't rely completely on dedicated fixed-function hardware -- instead, part of the computing process is passed on to the GPU's shader units, so the power draw should be markedly higher than it was with H.264 material. Otherwise, HDMI 2.0 is, unfortunately, missing; only HDMI 1.4a, DP 1.2 and eDP 1.3 are on board. With these interfaces, it's possible to run up to three displays at a maximum resolution of 3840x2160 pixels at 60 Hz (though not all simultaneously at such a high resolution; max. 24 Hz @ 4K via HDMI). Just a few weeks after the official presentation of the first three models -- the Core M-5Y70, 5Y10a and 5Y10 -- Intel already announced their discontinuation: Due to an error in the E0 stepping, the manufacturer had to deactivate the TSX-NI instruction set extension (a technology that optimizes memory access in multi-threaded environments). Even though most end users probably wouldn't notice the problem, four new processors with the revised F0 stepping will be released to the market in the coming weeks. Depending on the model, the base clock rate now lies at 0.8 to 1.2 GHz, which can be traced back to the previously discussed TDP of just 4.5 Watts. The powerful turbo should take care of peak loads by increasing the clock frequency to between 2.0 and 2.9 GHz. The turbo isn't dependent on the number of cores under load. Like the 4 MB L3 cache and the dual-channel memory interface, the HD Graphics 5300 graphics unit is identical for all models. At most, there may be small differences in performance, due to the differing maximum clock frequencies of between 800 and 900 MHz. Alongside the standard TDP of 4.5 Watts, all models also allow the notebook manufacturer to adjust the power consumption rate upwards (6.0 Watts) or downwards (3.5 Watts). On paper, only the CPU's base clock frequency should change (600 MHz at 3.5 Watts, +200 MHz at 6 Watts), but in practice this adjustment could make a significant impact on the CPU and GPU's use of the turbo. 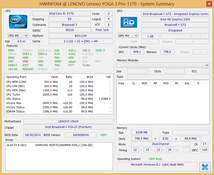 The Lenovo Yoga 3 Pro is one of the first devices to be based on Broadwell architecture. 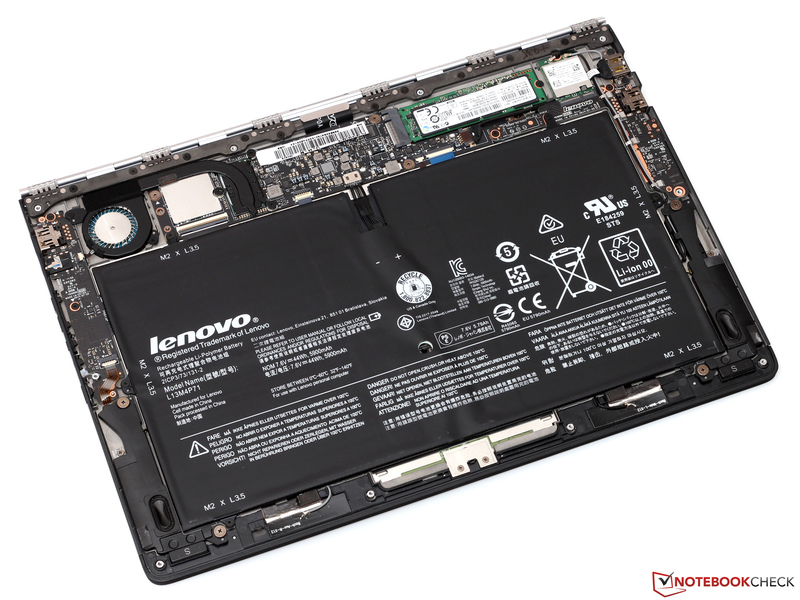 The hybrid notebook's predecessor employed a conventional 15-Watt processor, but with the changeover to the more energy-efficient Core M-5Y70 (1.1 - 2.6 GHz), Lenovo was able to drastically reduce the size and weight of their 2-in-1 -- an improvement which is especially advantageous in tablet mode. Unfortunately, the Yoga 3 breaks one of the new 14-nm generation's most important promises: The device's cooling isn't purely passive. There is one small fan in the case, and though its rotational speed is low, it prevents the hybrid notebook from running silently. 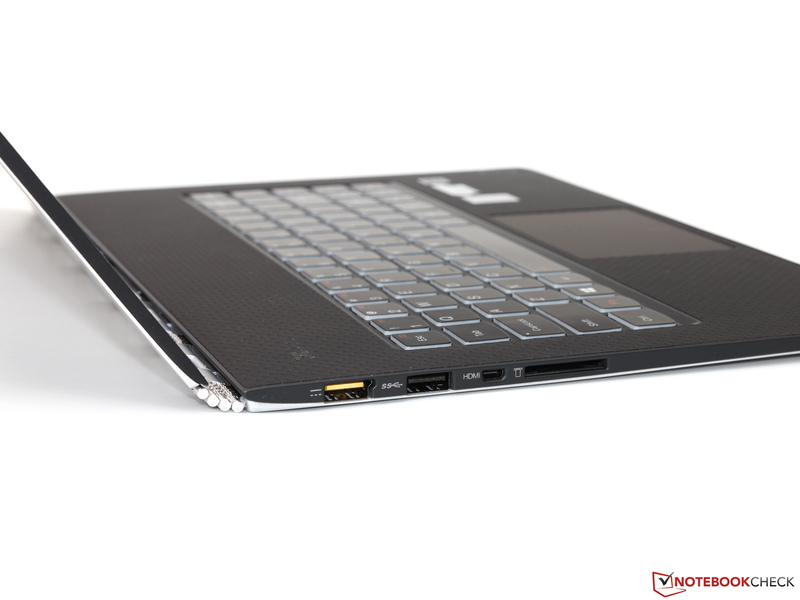 You'll find more detailed information on that subject in our coming comprehensive review of the Lenovo Yoga 3 Pro. The notebook's other components include 8 GB of soldered LPDDR3 memory, a 256 GB Samsung SSD, and a 13.3-inch display with a resolution of 3200x1800 pixels. 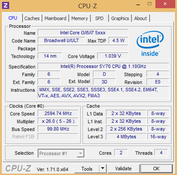 We ran all our benchmarks under Windows 8.1 64-bit with the preinstalled drivers. At first glance, our CPU benchmarks don't paint a very consistent picture: While the Core M-5Y70 places far ahead of the Core i5-4200U in some tests, in other cases the new processor falls behind by a margin of more than 20%. The new SoC surpasses its predecessor model, the Core i5-4202Y, in every discipline, though depending on the application, we see considerable variations here too. This behavior is correlated with the way the turbo boost functions -- in the Core M processor, the turbo boost acts more dynamically than ever before. Even when both cores are under full load, the SoC runs short benchmarks at the maximum clock rate of 2.6 GHz; but as the benchmark length increases, the clock speed successively decreases. This makes it difficult to make generalized statements about the processor's performance -- both the length of load and whether the device was previously in idle mode are critical factors. A typical tablet/convertible user is unlikely to work with Cinebench and other such benchmarking applications, so the device's performance when running everyday applications and surfing are probably of much greater import. Here, the powerful turbo flexes its muscles and enables the Core M to achieve excellent results in our browsing benchmarks. These results are especially interesting when compared to those of ARM competitors, like the iPad Air 2 (Apple A8X) or the Nvidia Shield Tablet (Tegra K1): The Broadwell processor in the Lenovo Yoga 3 Pro outperforms even the current high-end SoCs at work in these devices by factors of two or three. The top model Core M processor, the Core M-5Y71, runs 300 MHz faster and should attain even better results than the Core M-5Y70 we tested here. While Broadwell's lead over the ARM competition in our CPU tests was very impressive, the new SoC's results in the GPU benchmark GFXBench 2.7 are frankly unimpressive. Even an iPhone 6 only comes in 20% behind our test device; the fastest tablet SoCs actually compute more than 30% faster here. 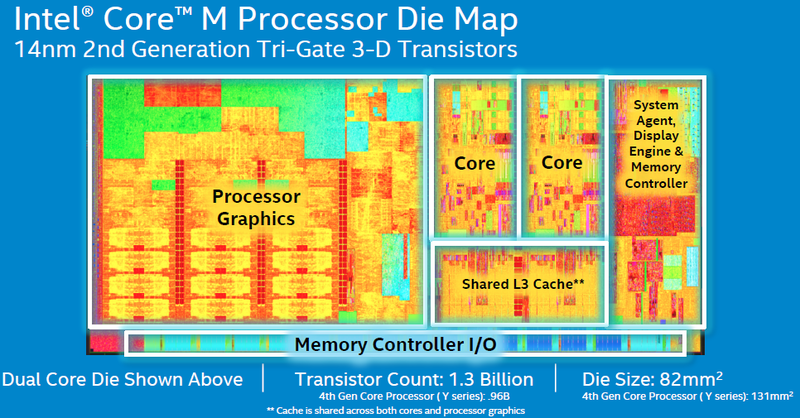 Intel clearly should have invested more chip space in the graphics unit, as the comparison between the Apple A8X (3 million transistors) and Broadwell/Core M (1.3 million transistors) proves. The results from our numerous gaming benchmarks confirm our hunch that the HD Graphics 5300's performance barely surpasses that of the HD Graphics 4200. Consequently, the graphics performance is substantially lower than that of Haswell-based ultrabooks with conventional 15-Watt CPUs and the HD Graphics 4400. As a result, only a few current games with low hardware demands -- for instance The Sims 4, Grid: Autosport and F1 2014 -- can be fluidly rendered at minimum settings and XGA resolution (1024x768 pixels). 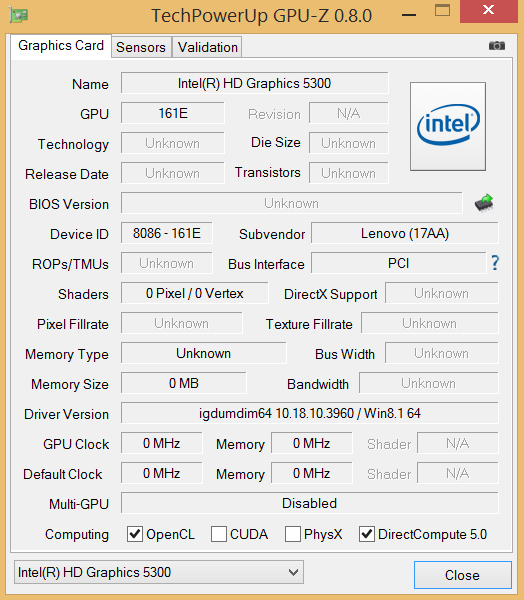 Unfortunately, it's little consolation that Intel's graphics drivers are now of an entirely satisfactory quality and we didn't run into any graphics errors or incompatibilities. We'll finish off this topic with a short look at the frames rates we recorded for the game Dota 2. 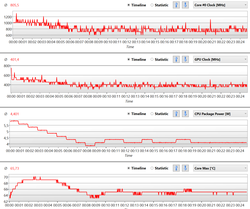 There are no obvious outliers in this graph, and starting at 30 fps, the game should run well. Because the whole turbo boost issue is so complex, with the help of four example scenarios, we want to try to make sense of it all. All the tests were run after the device had been in idle mode for some time. 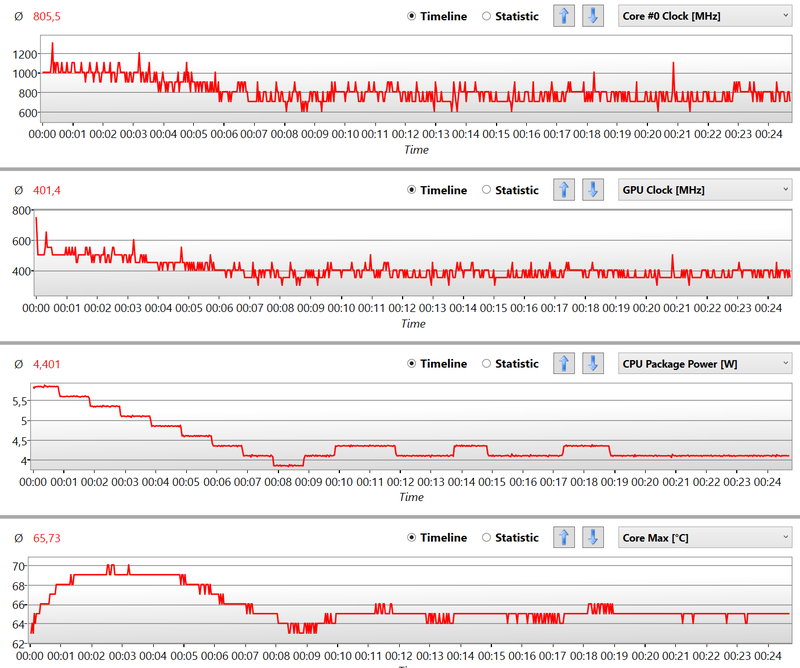 For our first scenario, we selected the benchmark SuperPi 32M, which only loads one core fully over a 10-minute period. As to be expected, the Core M-5Y70 began the test at the full 2.6 GHz, which drove the chip's power consumption rate up to about 6 Watts -- 1.5 Watts more than the TDP allows. After about 60 seconds, the clock rate decreased slightly at first, then in the following minutes leveled off at just 2.1 GHz. Consequently, the energy-usage rate even fell below the specified 4.5 Watts. Lenovo was perhaps too conservative here, as neither the Core M's core nor the Yoga 3 Pro's case grew excessively hot. Our test device behaved very differently in the Cinebench R15 multi-thread test. In the beginning, we did in fact see the full CPU turbo of 2.6 GHz, but after just 20 seconds, the frequency fell to just 1.8 GHz. At almost 12 Watts, the power-consumption rate blatantly exceeded the TDP, which resulted in a steep increase in temperatures. 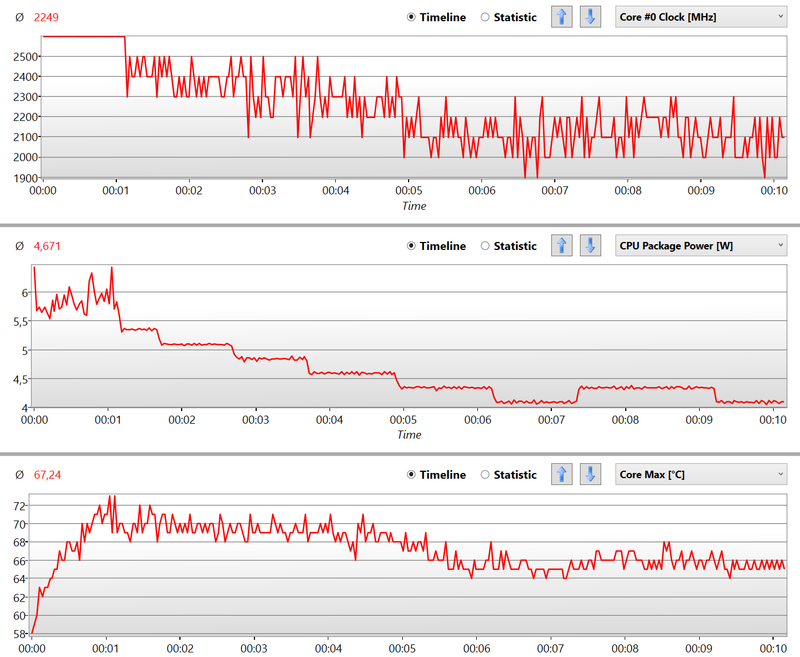 However, the decrease in clock speed and energy usage prevented the device from overheating. 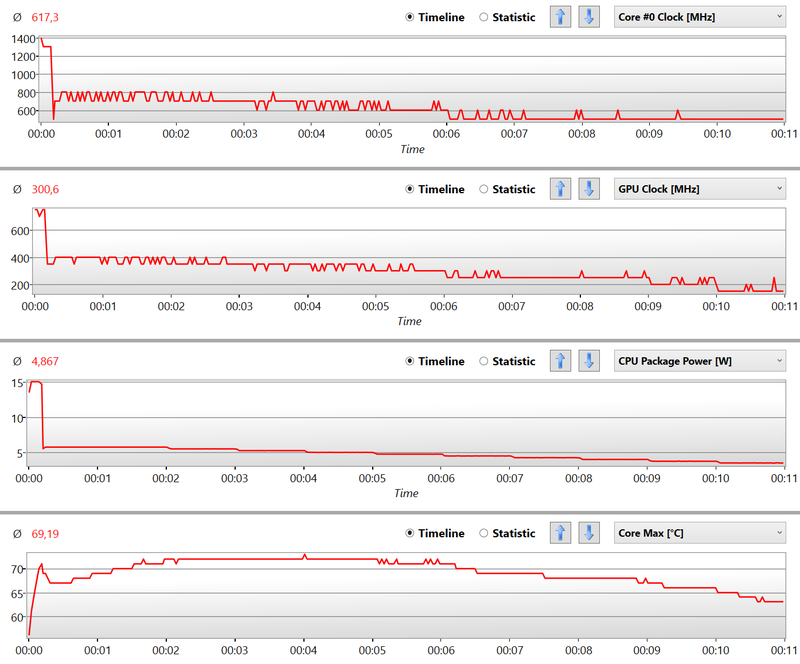 Shortly before the three-and-a-half minute benchmark ended, we recorded a core clock rate of 1.7 GHz at a power consumption rate of about 5 Watts. Unlike SuperPi and Cinebench, both of which only load the processor, our next test also employs the graphics unit. The action-RTS Dota 2 is popular with both casual gamers and pros, and it's one of the few current games the Core M-5Y70 can render fluidly, albeit at low settings. Since the chip already has to get to work in the menu and while the game is loading, we didn't see any obvious peak in the CPU or GPU frequencies at the beginning of our measurements. We did, however, see the frequencies drop slightly within the first 10 minutes of the game, which had a corresponding effect on the frame rate. The gaming benchmarks displayed above should therefore only be considered a point of reference; as is true for many other low-voltage CPUs, the performance drops a little as the game runs longer. To finish up, we'd like to take a look at our stress test, in which Prime95 and FurMark run simultaneously, simulating a theoretical full-load scenario for both the processor and the graphics unit. Once again, the power-consumption rate rose after a short period -- reaching a new record of a full 15 Watts. In the seconds immediately following that spike, the clock rate dove to about 6 Watts, after which the clock speed and energy-usage rate both continued to fall at a much slower rate. 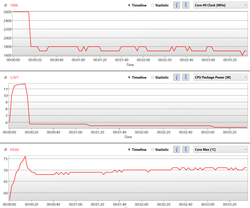 Only when the power-consumption rate had fallen to just over 4 Watts did the system stabilize. The CPU and GPU had to reduce their clock frequencies to 500 MHz and 150-200 MHz, respectively. Just as we saw in the gaming test, the processor didn't even run at its guaranteed base clock rate here either. In summary, the Core M exceeds its TDP by a much greater margin percentage-wise and for much longer periods than any Core CPU before it. Even so, it's justifiable for the Core M-5Y70 to be classified as a 4.5-Watt SoC: Under sustained load, the power-consumption rates certainly fall below this number. 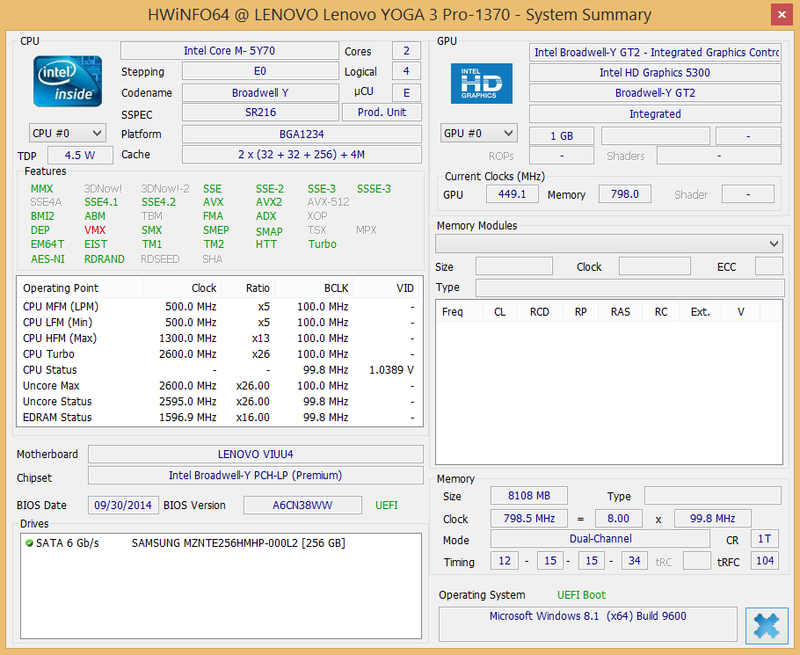 It even seems possible that Lenovo chose to set the TDP for their Yoga 3 Pro to an even lower number -- about 4 Watts -- despite the fact that the device is actively cooled. Our measurements certainly seem to suggest that. However, the newly introduced HP Envy x2 proves that Broadwell chips can run in a fanless case without overheating. With its extremely sharp QHD+ display (3200x1800 pixels), the Lenovo Yoga 3 Pro is basically predestined for displaying high-resolution 4K material. 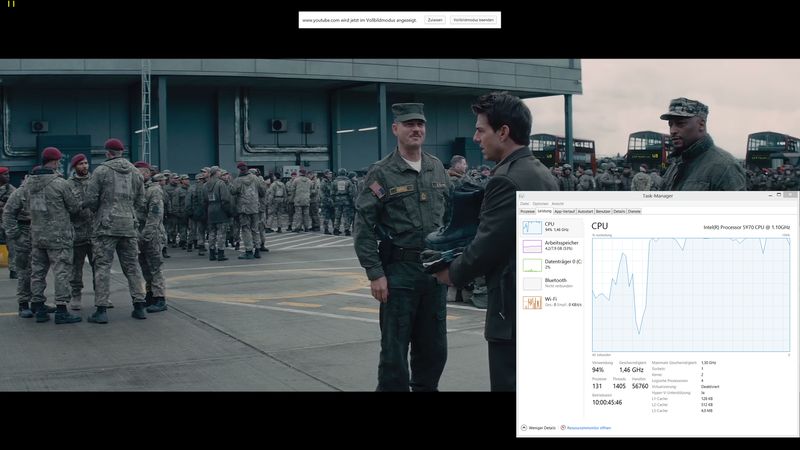 Even with the high data rate of about 100 Mbit/s, the device rendered our test video in the H.264 codec fluidly over the course of the entire video, at a CPU load rate of less than 20%. 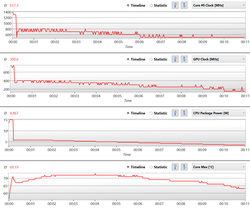 With the new H.265 standard, the Core M had to work considerably harder: Just a 720p trailer pushed the CPU load rate up to about 40%. However, this could be the result of the fact that the existing hardware acceleration doesn't quite work with the graphics drivers and the player (VLC) we used in combination. Similar problems are probably also responsible for the stuttering 4K trailers on YouTube (Google Chrome 38). 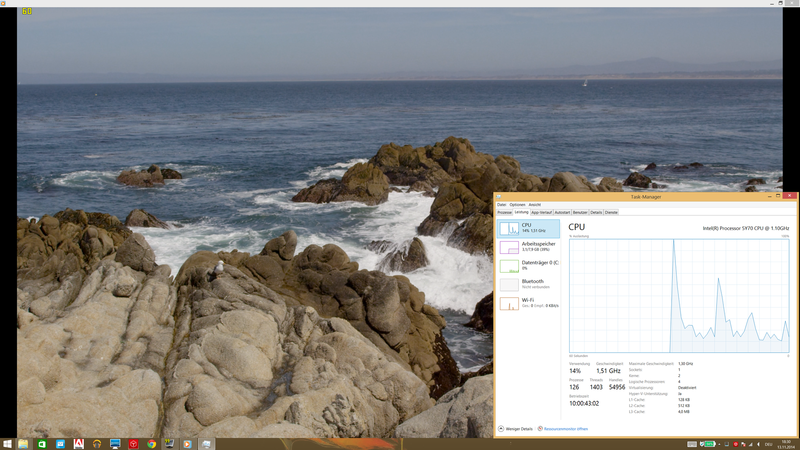 To encode and transcode videos, not only the CPU but also Intel's Quick Sync technology will do the trick. In our test, we converted the short film Big Buck Bunny (H.264, 1080p) to the iPhone 5 preset using CyberLink MediaEspresso. 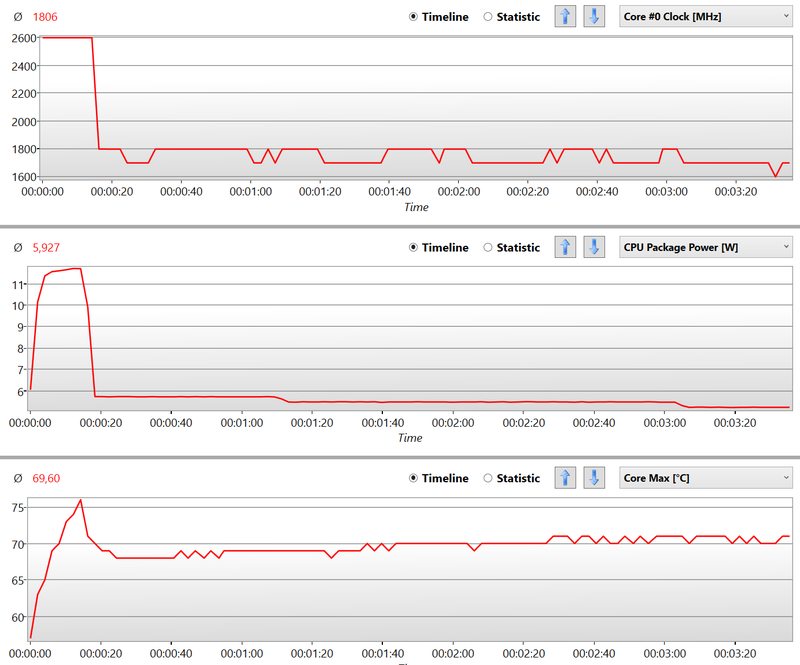 While this process took a full 758 seconds on the CPU, Quick Sync finished the same job in just 71 seconds. Subjectively, at least, the resulting image quality is identical. Unfortunately, we're unable to provide a direct comparison to a Haswell Y model here, but in earlier tests, a Core i7-4600U (15 Watts) needed 480 seconds / 61 seconds (CPU and Quick Sync, respectively) -- comparatively, not a bad result for the much more energy-efficient Core M.
Considering the radically lower TDP, straight from the beginning of our tests it was clear that the new Core M series can't compete with the performance of commonplace ultrabook CPUs from the older Haswell generation. But we were surprised with how close the Core M-5Y70 came to its 15-Watt siblings in many of our benchmarks: The higher per-MHz performance and powerful turbo boost enable the performance to spike to unimaginable heights, at least briefly. Even though the CPU successively lowers its clock rate after several seconds, enough performance reserves remain for everyday applications and multitasking. In view of the low energy-consumption rates, the 3D performance is acceptable as well -- though some ARM competitors are stronger here. 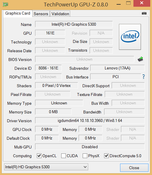 For current games, the HD Graphics 5300 is almost always too slow. Users will be better off limiting themselves to simple casual games from the Windows Store or enjoying the chip's manifold multimedia talents. We would have liked to pit the Core M-5Y70 against AMD's A10 Micro-6700T, but so far no product with this processor is available here in Europe. We're also sorry to disappoint any of you who are longing to hear about stronger Broadwell CPUs from the 15, 28 and 47-Watt classes; at least the ultrabook chips should be released in the beginning of January at CES 2015, while the quad-core powerhouses are to be expected later this coming year.